David Rodriguez Hernandez, 43, escaped to Mexico with his wife following the Feb. 2013 killing of 37-year-old Victor Sanchez, who fell victim to a jealous lover’s plot that unexpectedly turned fatal. The jealous lover, Maria Fajardo, was convicted in Dec. 2014 of second-degree murder in the death of Sanchez, who was her ex-boyfriend. Fajardo allegedly paid Hernandez to have Sanchez brutally injured on multiple occasions after he became entangled with other women. In one instance, assailants beat Sanchez with a tire iron, leaving him hospitalized with broken bones and facial injuries. Then in Feb. 2013, assailants tasked with shooting Sanchez in the knee ended up killing him. Investigators alleged that Hernandez participated in both attacks and recruited three teens to shoot Sanchez. After the assailants ended up killing Sanchez, Hernandez fled to Mexico with his wife, Christine Garner. Mexican authorities arrested Garner, but Hernandez evaded capture until recently. Garner, who was convicted of multiple crimes in the case, testified during Fajardo’s trial in exchange for a reduced sentence. Garner said that Fajardo paid her and her husband to injure Sanchez on two occasions. Fajardo was unsatisfied with the damage inflicted in the initial attack on Sanchez, so she paid to have him shot in the kneecaps, Garner testified. In Jan. 2015, Fajardo was sentenced to 21 years to life in prison. At that time, four suspects in the fatal shooting, including Hernandez, were believed to be hiding in Mexico. 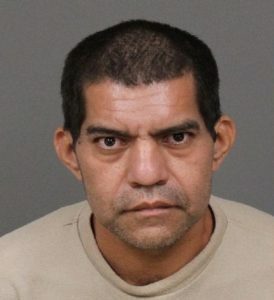 Hernandez was booked into the San Luis Obispo County Jail last week. In addition to a murder charge, Hernandez is being held on 12 other charges, including conspiracy, robbery, assault with a deadly weapon and inflicting great bodily injury during a felony. His bail is set at $250,000. The cost to the California taxpayers for these crimes and criminals is taking money from our schools, infrastructure and other services. I am tired of seeing California spending millions to appease their future voting base. Last week Gov Newsom committed $25 million to San Diego for social services for the illegal infiltrating into our State. Yesterday I lost another neighbor who moved out of California and on they are on their way to Missouri. Thank you Democrats for our Sanctuary Status and STOP TAXING ME!! Yet one more guest of the Baja Penal Colony.